This page is intended to be a review of my Christmas beers from years gone by. It will be a challenge to remember the flavors and what I liked about them. I saved the bottles for a reason, even if I only liked the bottle. I'm sure the reminiscing will be fun. Not quite sure of the year on this one, but from my research, the brewery closed in 1996. I distinctly remember pouring this into a glass and about half way, there was an explosion of foam over flowing the glass. What a great snow maker! Following up with a much slower and careful pour, I was pleased with it's aroma, and flavor. It left me with a fond Christmas memory! From a brewery established in 1654, this Belgian-style Christmas ale is an annual release. I wasn't sure about the date I sampled this one, but I do remember it had a nice foamy head with traditional fruity flavors and candy sweetness. Belgian ales are not for everyone, but I certainly enjoy the ones brewed for Christmas. They usually have some spices of the season added and make a good sipper while enjoying my favorite Christmas music. A special holiday brew for the 2003 season featured six varieties of roasted malts, a thick rich head, and deep carmally color. A thick brew with a toffee finish brought holiday cheer to all! This beer has its own glass! What better way to start the remembrance of past holiday beers than with last year. It was a very good beer! The celebration ale is a special brew that has become a traditional selection at the lounge. Consistently good, it always brings cheer to the season. This limited edition Lager was a special brew, just for the holidays. What a great way to celebrate. Better than the average mass produced beer recipes, this one was a nice example of an American Lager that was perfect for a season of caring and sharing! 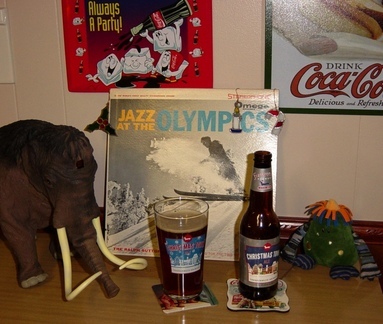 Back in the mid 90s, this was my favorite Christmas beer. Brewed with nutmeg and raspberries, this medium dark amber ale had a festive flavor and great aroma. From around 2005-2006, this was a champagne style beer. It even came in a magnum bottle. It was a highly carbonated brew with a thick white head that lasted. From what I remember, it was a cloudy, medium dark ale. It had a typical fruity aroma and flavor. It was sweet like a champagne, and I don't remember the flavor level of any seasonal spices added, and not sure how much I liked it. The bottle is cool and festive. The label is baked on the glass, so it's permanent.